In order to enroll in this program, please select your medication, read the Terms and Conditions carefully and answer the questions below. Offer is NOT valid for California or Massachusetts residents. Patients are responsible for the first $10 co-pay for a 30-day supply of GLEEVEC and Novartis will pay up to $10,630 per 30-day supply up to $30,000 per calendar year. Patient is responsible for any costs once the limit is reached in a calendar year. This offer is available for patients with a prescription for KISQALI, a prescription for FEMARA (including generic letrozole), a prescription for both products, or a prescription for the KISQALI/FEMARA Co-Pack. Use of the offer for FEMARA (or generic letrozole) does not require a KISQALI prescription. Offer is NOT valid for purchases of FEMARA only by California or Massachusetts residents. Are you taking SANDOSTATIN for an approved use, consistent with the product’s prescribing information (see link above)? You are not eligible for this co-pay program. For more information, please call Novartis at 1-877-577-7756. I am the patient, or I have the patient’s consent or the legal authority to enroll the patient in this program and I am over the age of 18. I have reviewed the Novartis Oncology Universal Co-pay Program Terms and Conditions and certify that I meet the eligibility criteria for the program and I will comply with the Terms and Conditions of the program. In order to proceed with enrollment, please complete the eligibility certification above. Patient is not eligible. 1 voucher per life of the program. I consent to receive marketing calls and texts from and on behalf of Novartis Pharmaceuticals Corporation, made with an autodialer or prerecorded voice, at the phone number(s) provided. I understand that my consent is not required or a condition of purchase. I agree to the TCPA Terms & Conditions . Number of messages will vary based on your program selections. Message and data rates may apply. Text STOP to opt out and HELP for help. May we leave a voice message on your home phone, including mentioning the product name on the voice message? If you have an existing co-pay card and need to let us know about an insurance change, or if any personal information associated with the card has changed (such as your name or address), please call 1-877-577-7756. 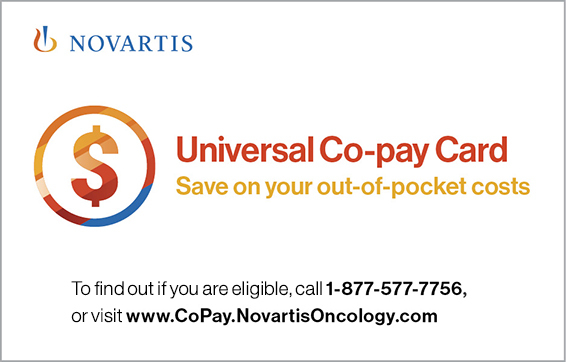 The Novartis Oncology Universal Co-pay Program includes the co-pay card, payment card, or rebate with a combined annual limit of $15,000. Patient is responsible for any costs once the limit is reached in a calendar year. This offer is only available to patients with private insurance. The program is not available for patients who: (i) are enrolled in Medicare, Medicaid, TRICARE, VA, DoD, or any other federal or state health care program; (ii) are not using insurance coverage at all; (iii) are enrolled in an insurance plan that reimburses for the entire cost of the drug; or (iv) where product is not covered by patient’s insurance. The value of this program is exclusively for the benefit of enrolled patients and is intended to be credited toward patient out-of-pocket obligations, including applicable co-payments, coinsurance, and deductibles. Patient may not seek reimbursement for the value received from this program from other parties, including any health insurance program or plan, flexible spending account, or health care savings account. Patient is responsible for complying with any applicable limitations and requirements of his/her health plan related to the use of the program. program is not valid where prohibited by law. Valid only in the United States and Puerto Rico. Offer is not valid for California or Massachusetts residents for certain medications. This program is not health insurance. This program may not be combined with any third-party rebate, coupon, or offer. Novartis reserves the right to rescind, revoke, or amend the program and discontinue support at any time without notice. Patient Instructions: After enrollment in the program, present this card and your insurance card along with a valid prescription at any participating pharmacy or through mail order. Patients are responsible for up to the first $25 (specific offer varies by brand) and Novartis pays up to $15,000 per calendar year. If patient reaches the maximum annual cap per calendar year of $15,000, patient will be responsible for the difference. When you use this card, you are certifying that you understand and agree to comply with the program Terms and Conditions above. Direct patient questions to: 1-877-577-7756. When you use this card, you are certifying that you understand and agree to comply with the program Terms and Conditions above. Patient questions, please call 1-877-577-7756. You and Novartis agree that any legal disputes or claims arising out of or related to the Terms and Conditions, or the use of the Novartis products and/or the Services (including but not limited to telephone calls or text messages sent by Novartis), or the interpretation, enforceability, revocability or validity of the Terms and Conditions, or the arbitrability of any dispute), that cannot be resolved informally shall be submitted to binding arbitration in the state in which the Terms and Conditions was performed. The arbitration shall be conducted by the American Arbitration Association under its Commercial Arbitration Rules. This arbitration clause is an independent agreement and shall survive the termination and/or transfer of these Terms and Conditions or any other agreement between you and Novartis. If any provision of the agreement to arbitrate in this Section 6 is found unenforceable, the unenforceable provision will be severed and the remaining arbitration terms will be enforced (but in no case will there be a class, representative or private attorney general arbitration). Any judgment on the award rendered by the arbitrator may be entered in any court having jurisdiction thereof. Claims shall be brought within the time required by applicable law. The laws of the State of New York will govern the Terms and Conditions and the Federal Arbitration Act, 9 U.S.C. §§ 1-16, will govern this Section 6, without giving effect to any principles of conflicts of laws. Each party shall bear its own costs relating to the arbitration consistent with the Commercial Arbitration Rules of the American Arbitration Association. You and Novartis agree that any claim, action or proceeding arising out of or related to the Terms and Conditions or telephone calls or text messages sent by Novartis must be brought in your individual capacity, and not as a plaintiff or class member in any purported class, collective or representative proceeding. The arbitrator may not consolidate more than one person's claims, and the arbitrator may not otherwise preside over any form of a representative, collective or class proceeding. YOU ACKNOWLEDGE AND AGREE THAT YOU AND NOVARTIS ARE EACH WAIVING THE RIGHT TO A TRIAL BY JURY OR TO PARTICIPATE AS A PLAINTIFF OR CLASS MEMBER IN ANY PURPORTED CLASS ACTION OR REPRESENTATIVE PROCEEDING.